That's a packed tub! I bet with three kids in there not a lot of water stays in the tub. What a cute trio! I bet bath time is a blast. How cute. I bet they had a fantastic time! What fun! 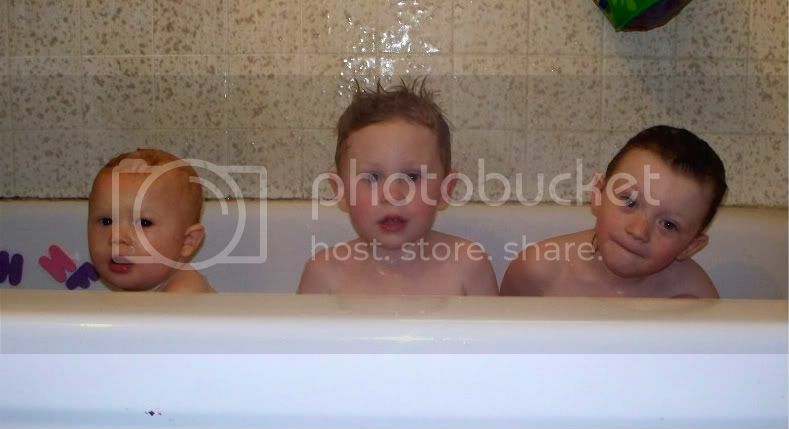 My kiddos only bath together about half the time-we only have a shower that a baby tub fits in so, even though they both fit, it isn't too spacious! LOL! It is a little crowded in there but it is a lot easier for me to bathe them all at once. Thanks for stopping by and leaving me a comment! How fun is that!! I love bath pictures! Happy WW! What a fabulously cute pic! Bubble baths are the best — I still love them at 38! They adorable! I have a picture like this from when I was younger :)! I remember those days. My oldest is 25 now and my baby is 7..